Did you know that these veggie combos make a great celery and potato soup?! Yes, good old potatoes and celery ... and onion! 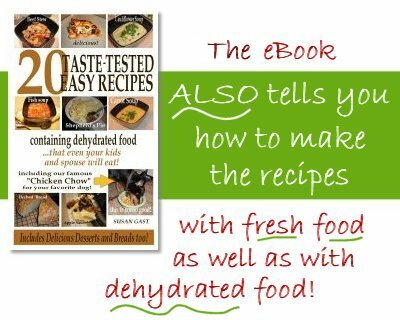 The basis of this soup is made from dehydrated veggies, but scroll on farther down the page and click on the banner for our Recipe eBook. 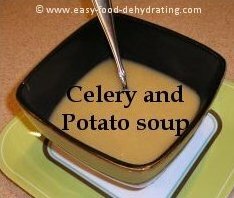 My photo shows the soup blended; however, if you like the look of the potatoes and celery in your soup bowl, just blend only a small portion of the soup to act as a thickener to the stock. Then add that blended portion back in the pan, give it a stir then serve. All it boils down to is how do you like your soup? With 'texture' or smooth? 2. When they are sufficiently plump, put the veggies into a heavy saucepan, toss the excess water, and add the vegetable stock to the pan. 3. Add the chopped parsley, tarragon, celery salt, and cumin. Bring to a boil and simmer for about 30 minutes, or until the vegetables are fully cooked/soft. 4. Use a blender to mix, in small batches ... allow air to escape from the little hole in the lid so that the heat doesn't cause any explosive problems! Just have your hand over that top little hole to catch any runaway splashes. 5. Blend until smooth, about 45 - 60 seconds. This is quite a mild and filling soup. It's easy to make and everyone loves it! If you prefer NOT to put it in the blender for a smooth soup, go ahead! If you look at the curried version, you'll see that I didn't blend it (might have been in a hurry that day!) Whatever the reason was, it still tastes great!